Stainless steel case with a stainless steel link bracelet. Unidirectional black ion-plated bezel. Black dial with luminous hands and dots hour markers. Minute markers around the outer rim. Date displays at the 3 o'clock position. Quartz movement. Scratch resistant anti- reflective sapphire crystal. Screw in crown. Case diameter: 28 mm. Case thickness: 10 mm. Deployment clasp. Water resistant at 300 meters / 1000 feet. 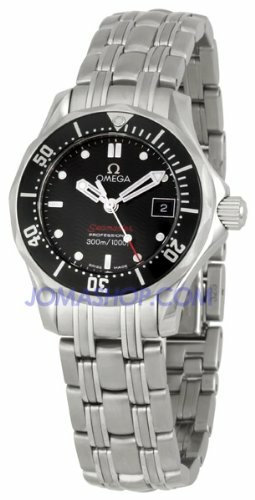 Omega James Bond Seamaster 300M Quartz Ladies Watch 212.30.28.61.01.001.